The Blob is a classic American science fiction movie, released in 1958, in which a gelatinous alien creature arrives on Earth aboard a meteorite. Upon emerging, the creature causes mayhem by absorbing anyone with whom it comes into contact, enlarging with each meal. The Blob was the maiden film of Philadelphia native and film distributor Jack H. Harris and was shot in and around Valley Forge, Pennsylvania. Harris's friend, Irvine H. Millgate, a professor of humanities at Northwestern University, developed and received screen credit for the film concept. This was also Steve McQueen's movie debut. Teenager Steve Andrews (played by a much older McQueen) sees a meteorite fall while with his girlfriend, Jane Martin (Aneta Corseaut). The couple manage to find the landing site but not before the meteorite's pulsating extraterrestrial passenger has oozed onto the arm of an unfortunate old man (Olin Howlin), whom the two teenagers rush to a doctor. After hanging out with Steve's drag-racing pals, Steve and Jane head back to the doctor's office just in time for them to see the doctor, along with his nurse and patient, be enveloped by the Blob, which unpleasantly turns blood-red in the process. As the Blob leaves no trace of itself behind, the police who come to the scene don't take the teenagers' story seriously. While their friends try to raise the alarm about the literally growing danger, Steve and Jane check out Steve's ominously deserted store and encounter the Blob, which has meantime snacked on an auto mechanic. Barricaded inside the store's walk-in freezer, they are reprieved when the Blob, which had begin to squeeze beneath the door, suddenly and puzzlingly retreats. In one of the most memorable scenes, the Blob overwhelms an entire cinema during a midnight showing of Daughter of Horror. Producer Harris makes a cameo appearance as one of the patrons fleeing the theater. When Steve, Jane, and her little brother are trapped inside a diner, a power line that is dropped ineffectually onto the Blob triggers a fire, and as Steve puts out the flames with a CO2 extinguisher, he sees the Blob recoil. Remembering its retreat from the freezer, he figures out that cold may be the key to combating the Blob, and passes on this idea to a sympathetic cop, Dave (Earl Rowe). Quickly, the other kids break into the high school and retrieve more extinguishers, with which the Blob is frozen, contracting sufficiently to let our heroes escape through the windows of the diner. 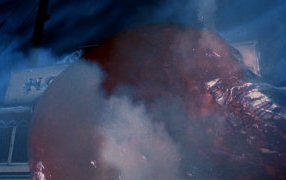 The Blob is then airlifted to the Arctic by the Air Force, while the words "The End" appear on the screen before metamorphosing into a question mark. Thirty years after the original was released, Chuck Russell directed a remake of The Blob (1988). This remains largely true to the original story up to the point where the would-be hero, Paul Taylor (Donovan Leitch), is added to the alien's victims. Taylor's girlfriend Meg (Shawnee Smith) then joins forces with a young tough (Kevin Dillon), and eventually blows up an artificial snow truck to freeze the Blob, which can form tentacles and is revealed to be a governmental experiment in germ warfare. Gelatinous masses in real-life have been found and posed temporary puzzles as to their identities. These gooey blobs have included instances of slime mold and parts of sea creatures that have been washed up on the shore. 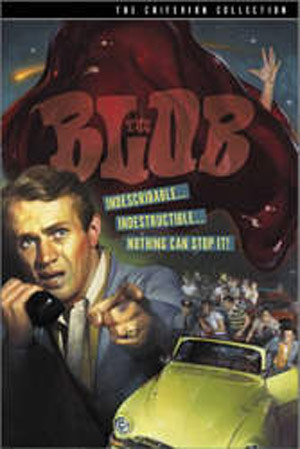 The Blob has the distinction of being the only nonanthropomorphic creature to have inspired a top-40 pop song (written for the film by Burt Bacharach. Since 2000, Phoenixville, Pennsylvania has held an annual "Blob Fest," which includes a re-enactment of the scene in which moviegoers run screaming from the town's Colonial Theatre. In the 1988 remake, a full body cast was made of Donovan Leitch for one of the more complicated models where the Blob lands on top of his character, Paul taylor. About 50 people were needed to run the animatronic Paul. Director Chuck Russell did not tell Shawnee Smith, who played Taylor's girlfriend, that it wasn't really Donovan Leitch underneath the Blob so he could get more of a shock out of her on film. That is the take that is now seen in the movie when Meg screams out Paul's name upon discovering him.